This is a comprehensive lease for letting a shop or other retail unit with a flat or maisonette above for the tenant to live. The shop could be used for any purpose for example: sale of goods, restaurant, cafe or sale of services (e.g. estate agency or PC repair). Features: service charge provision; guarantor; break provision; rent review options; option for assignment; sub-letting not allowed; draft agreement for security deposit. This lease is for a shop with a flat over. The shop will usually be in a parade. The shop may or may not have additional rooms used by the tenant for other business purposes, such as offices or storage. If the shop is not part of a parade, the relevant paragraphs can be deleted easily and obviously. The lease has been drawn to prefer the interest of the landlord rather than the tenant. We offer similar leases for shops where the tenant does not live at the property. 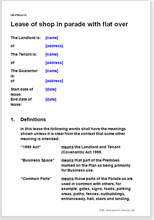 Use Shop lease agreement if the shop does not share services or facilities with other neighbouring shops owned by the same landlord. This lease agreement is comprehensive, providing alternative choices for important decisions.